Today, despite occasional talk about rebuilding the O&W to ease traffic congestion on Route 17 and greater congestion to come when the casinos are built, it's hard now to even tell that there was once a railroad there. We spent several hours scouring the area during the summer of 2001 looking for remnants. Even though we were familiar with the railroad's presence when it was still a going concern, the remnants are hard to find. And it's been fewer than 50 years since the last train ran through Liberty. Where the Liberty station used to be. The tracks ran to the left of the garage/warehouse that replaced the station after it burned. The white building to the right of the photo, now used as a lumber warehouse, is the oldest hotel still standing in the Liberty area (the third story was an addition relatively late in the history of that hotel). 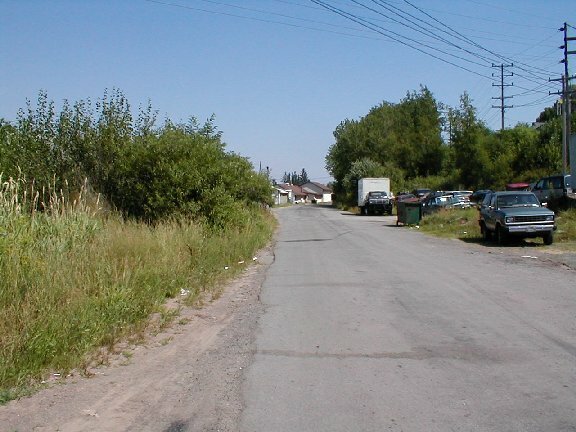 The area of the old Liberty station, from the other direction, near the old Dairylea plant. Here, we're looking along the former right-of-way back toward to where the station used to be. 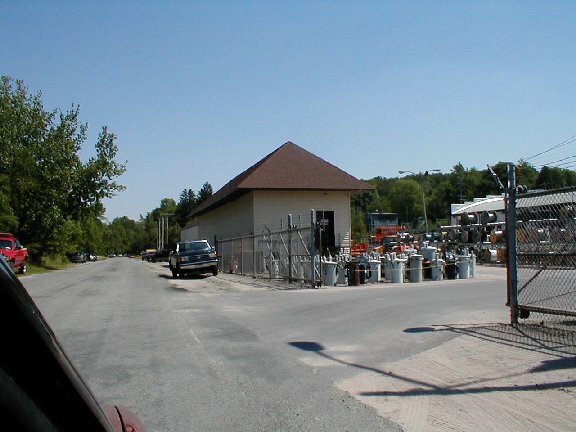 The warehouse/garage seen in the photo above that has "replaced" the station is in the center of the photo. 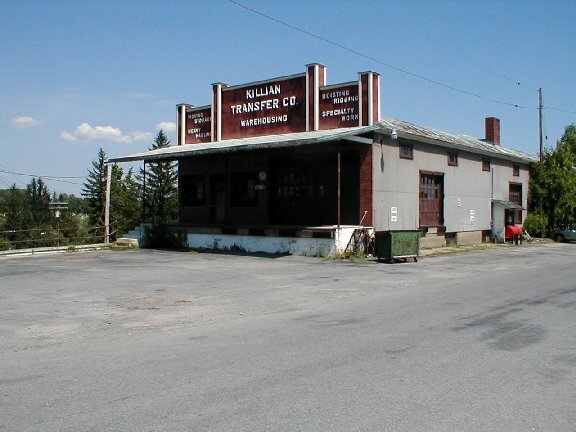 Killian's Transfer took over the LCL (Less than Car Load) freight business from the O&W many years before the demise of the railroad. Their warehouse is still present, diagonally across Lake Street from the site of the old station -- although it has become an antique store since the picture above was taken. Note the boxcar-level loading doors on the right side of the structure. This building was once a grain warehouse along the O&W tracks. Note the loading door in the center of the photo. (The tracks ran left/right.) The building backs on Railroad Avenue. This structure, also along the former tracks in the general area of the old station, has been treated more kindly. Its current use, by the local power company, seems to be storage of transformers. The roofline and the color are faithful (at least in this compiler's memory) to the O&W's original. 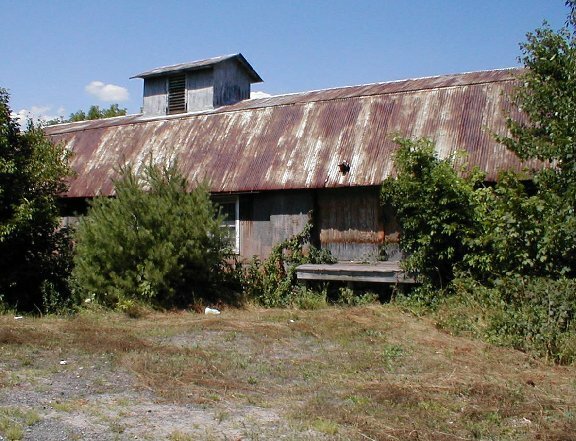 The original structure may have spent part of its life as the freight station in Liberty, and may have been moved one or more times before coming to its present location. In this case, the tracks ran to the left of the structure -- the view is looking toward Ferndale. Want to see what "the railroad" used to be like, all the way from Hoboken to Lake Ontario, with considerable interest in the portion of the "Old Woman" that ran through the Catskills? We heartily recommend the NYO&W Historical Society's website. to visit them. But don't forget to come back! 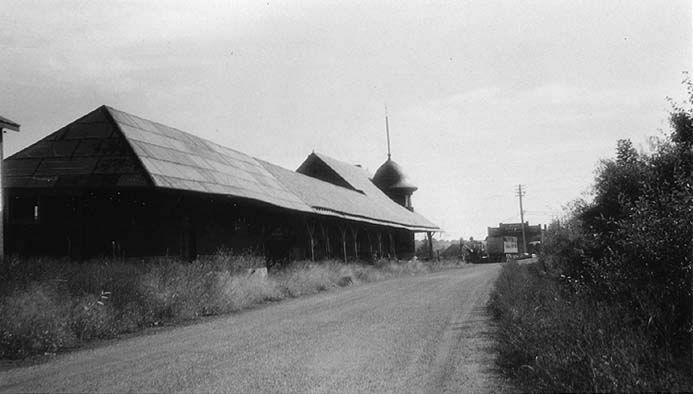 The above photo of the old station shortly after the railroad ceased operation, appears courtesy of Ronald J. Vassallo and the NYO&W Historical Society. Note the onion-shaped dome on the tower and Killian Transfer's building in the distance.